1924 Packard Single Eight - Stored since 1962! 1924 Packard Single Eight – Stored since 1962! Many 1920s Packards render enthusiasts stunned and mute as effectively as a Star Trek Phaser, either with their stately elegance or (in this case) their sense of history. 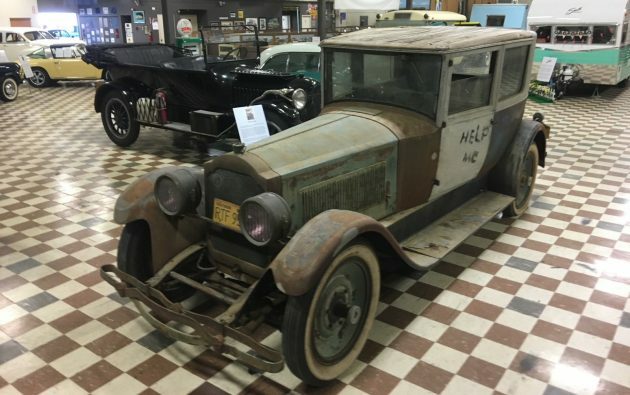 Two-door sedans appear rarely; indeed the seller claims this one alone survives among 1924 models. 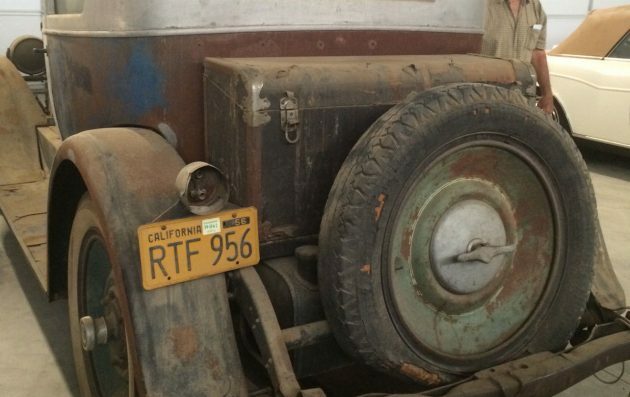 This never-restored 1924 Packard Single Eight awaits a new owner in Los Angeles, California, and retains most of its original parts in worn to worn-out condition throughout. 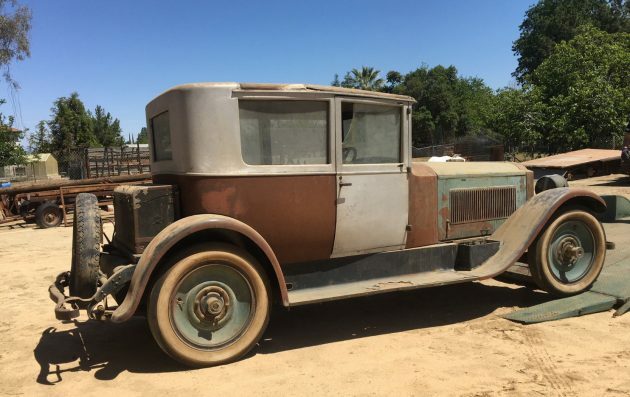 Listed here on eBay, the car’s $27,000 “Buy It Now” price may be the lowest I’ve seen in some time for a 1920s Packard this complete. 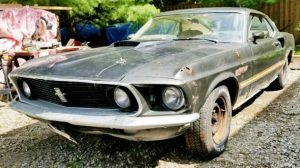 While a complete restoration should bless this vehicle at some future date, the never-restored look holds a certain cachet these days, to the point that mechanically sorted “barn finds” sometimes exceed the hammer price of their fully restored counterparts. With restoration begun, few would complain if this one immediately reclaimed its original glory. 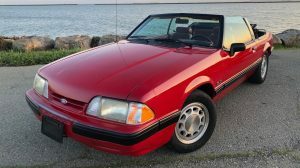 The seller refers to this as a “Victoria,” a phrase normally attributed to convertibles. I could find no evidence of an official Victoria body style (until the 1930s), or a coach builder named “Victoria.” Packardinfo.com lists a number of Single Eight bodies carrying four or five passengers, all by numerical designation. Perhaps a Packard expert can decode “Victoria” in the comments below. A clear picture of the body tag would be nice, but who has time for that for the sake of $27,000? As the standard-bearer for 1924, the Single Eight received more elegant appointments than Single Six models. Packard also introduced four-wheel brakes in a day when front brakes were considered needlessly complex and dangerous by many. Within a few years, four-wheel brakes appeared on most American cars, but Packard (along with Dusenberg and others) led the way. Packards for 1924 also included an air-pump driven off the transmission – handy for inflating those giant tires after a road-side patch. The car’s inline eight cylinder, currently under the knife, goes with the sale. Packard engineers ranked among the world’s best, and 1924 brought the new 358 cid “Single Eight” inline eight cylinder making an inherently-balanced 85 horsepower. Simpler and lighter than the V12 it replaced, the Single Eight remained Packard’s top engine through various upgrades until 1939. Thanks to macsmotorcitygarage.com for some details. If this car fit your budget, would you preserve and drive it or send it directly to the dream garage where your minions would effect a complete restoration? Way beyond the depth of my pockets but, I’d like to see it done and back on the road. There only original once . Why waste money and loose its original look. I understand and respect this belief but this is not the way it pulled out of the factory. Different color body panels on this beauty, needs restored. Packard built straight eights until 1954, in fact that’s all they built for 1951-54, and I wouldn’t call it the top engine during the run of the second Twin Six/Twelve in the ’30s. Also, an awful lot of Packards before WWII were bodied by coachbuilders, so this could easily be a one-off. Hi Andy! Your comments are accurate, and mine were based on the note that Packard retired this engine series in the late 30s, after which the newer “320” straight eight continued for some time. There were no 12 or 16 cylinder Packards in 1924, making this Eight the top engine that year, or at least that’s what my research determined. Thanks for the clarifications. Comments are what give the articles a life of their own! A result of the luxury war in the US motor industry. My Dad was born in 1923 and lived a couple blocks down from the Packard plant. Cool car! Leave her as she is. After all, she’s a lady. My grandfather worked at the plant until it closed. Did he get out of the factory alright? The Packard plant has always amazed me. Such a shame to see such a grand place that built equally grand machines has fallen so far. I keep hoping for a miracle; that at lease SOME of it will become a viable part of the city again. This is a Victoria and victorias were a two door sedan with a special clasic back end not like a regular two door. Much like a Model A Ford Victoria?? Ah, but “Victoria” sounds so much more sexier. Sellers and auction companies get pretty liberal with their definitions as I saw at the last Barrett-Jackson auction. One of the lots was a Riley Elf (badge engineered Mini) that someone in England had cut the top off. I think I paid about $2000 for it and imported to USA. Was pleased when I sold it for about $8000 15 years ago. Well, rather than describe it as a homemade hatchet job (which it is) Barrett described it as a “Riley Jolley” which never existed yet someone was suckered to the tune of $55,000! Packards: first with A/C among other things. 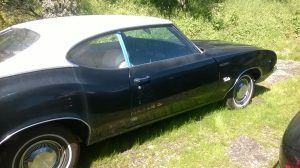 A great project for a car lover with vision and plenty of cash. I love the car guy who gave this car a voice by writing “Help me” on the driver door. Someone must have heard it! This is super cool. 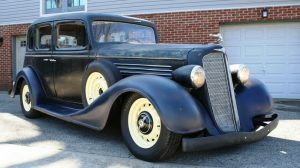 I have yet to own a pre-war car. When I finally do get one, I would love it to be something like this. But $27k is way out of my budget right now. 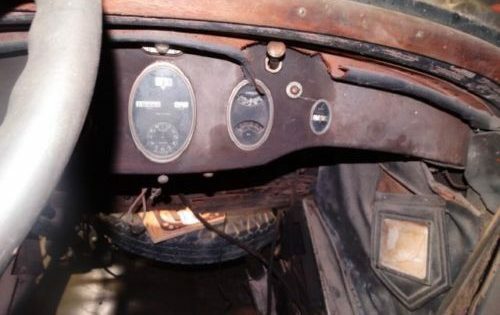 I wonder why there appears to be a tire under the dash , seems to be a strange place for a spare?? I wonder why there appears to be a tire under the dash , seems to be a strange place for a spare?? Are my old eyes just getting worse??? I hope someone answers this question, looks very odd to me too. Wow! I’d like to see it restored. Maybe the dudes over at Lane Motor Museum would be interested in a piece of history such as this – or another similar motor museum place. It definitely deserves a loving home. Your eyes are fine, that’s definitely a tire where the engine and trans should be. Probably just tossed in there to keep with vehicle.